Ditch the staticky radio monitor. Netgear's nursery cam puts eyes on your most precious prize. Netgear's Arlo line consists of security cameras for indoor, outdoor, and on-the-go monitoring. With Wi-Fi baby monitors all the rage, it’s not shocking that the manufacturer has set its sights on “guarding your most precious asset.” What is pleasantly surprising is just how well it pulls it off. On the outside, the $250 Arlo Baby has little in common with the distinctive look of other cameras in the Arlo line. It’s essentially two roughly tennis-ball sized spheres, one stacked on the other, to create an hourglass shape. That generic design is intentional, though; the camera serves as a generic body for several cute critter attachments that allow the camera to blend in with nursery decor. 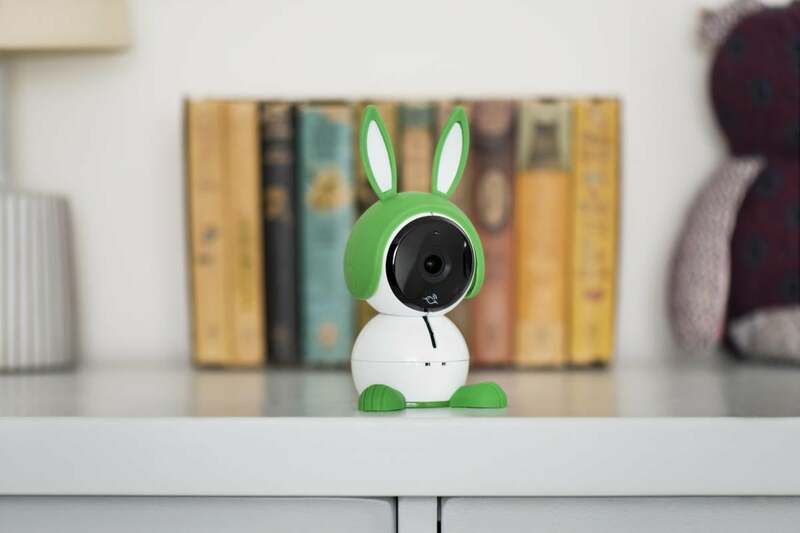 The camera ships with green bunny ears and feet, and you can purchase puppy and kitten accessories separately for $20 a set. Beneath the kid-friendly kit are the robust features we’ve seen in Netgear’s Arlo Q indoor security camera: 1080p full HD video, night vision, sound and motion detection, two-way audio, 24/7 recording, and free cloud storage. But Netgear used feedback from parents who had used the Q as a baby monitor to put a more nursery-centric spin on the Arlo Baby. To wit: A multicolored LED nightlight sits on the back of the Baby’s head unit, where it can help parents maneuver a darkened room without it disturbing a sleeping baby. Rather than a ring of infrared LEDs common to most home security cameras, Arlo Baby uses two smaller, dimmer LED lights that are less likely to wake the baby while still delivering up to 15 feet of night vision. 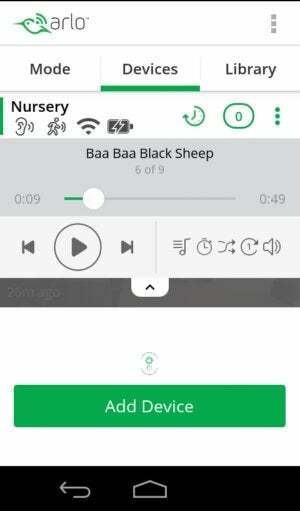 The camera also includes a built-in music player with nine lullabies playable from the Arlo companion app; you can download even more from a free library or record your own voice for playback to soothe your baby to sleep. Lastly, a pair of sensors monitor indoor temperature, humidity, and air quality levels and alert you when they’re out of range, so you can maintain an optimum nursery environment. You get access to seven days of event-triggered cloud recordings with purchase of the camera, for up to five cameras per account. If you need more, you can upgrade to the Premier plan, which gives you 30 days of cloud recordings for up to 10 cameras for $10 per month or $99 per year, or the Elite plan, which bumps it up to 60 days of cloud recording for up to 15 Cameras for $15 per month or $149 per year. The Arlo Baby includes a hidden a night light you control from the app. While these plans allow the Arlo Baby to record when motion or sound is detected, you’ll need a Continuous Video Recording (CVR) plan to take advantage of around-the-clock recording. Fourteen days of 24/7 CVR will run you $99 per year per camera, and 30 days costs $199 per year per camera. If you’re making the Arlo Baby a permanent fixture of you child’s room, you can either set it on a flat surface or mount it to a wall with the included bracket and plug into an electrical outlet with the supplied USB cable and power adapter. But knowing most parents tote their wee one with them from room to room throughout the day, Netgear also designed the Arlo Baby to be operate cord free, courtesy of a 2440mAh rechargeable battery. Once the camera is setup, you connect it to your Wi-Fi by downloading the Arlo app and following the onscreen instructions. The process took me no more than a couple of minutes. The Arlo Baby appears along with any other Arlo cameras you have connected on the devices tab of the app. From here you can control just about every aspect of the camera. A built-in music player comes stocked with lullabies and soothing sounds. Tapping the Play button on the camera’s preview window activates the live stream. Image quality is excellent with crisp detail and brilliant color. The Baby’s default field of view is 110 degrees, but you can modify that in the app up to 130 degrees or down to 90 degrees, depending on the size of the room. Along the top of the streaming window are Wi-Fi, battery, and sound and motion alert indicators; access a to timeline for use with CVR plans; and a counter displaying how many unwatched video clips are in your library. Under the window are the camera controls: buttons for pausing the stream, recording video on demand, taking a snapshot of the live feed and toggling the mic and speaker on and off. The Baby’s non-camera features are accessed via icons on the edges of the streaming window. A lamp icon opens the settings for the night light. Here you can chose select the light’s color and adjust its brighteness. 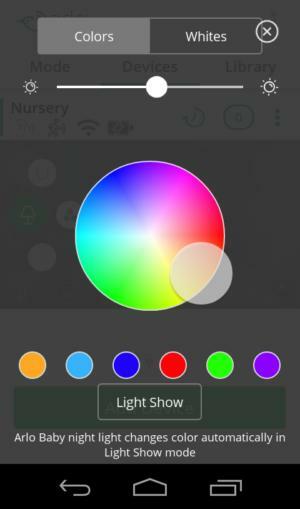 There’s also Light Show option that changes the color automatically. Whichever options you choose, the night light provides enough soft illumination to see by without lighting up the room like Times Square. The musical note icon opens the Baby’s built-in music player. It comes stocked with a playlist of nine lullabies, including “Rock-a-Bye Baby” and “Brahm’s Lullaby,” along with rainforest sounds and white noise. The song recordings are as gentle as a music box tune, and you can download more from a cloud library right from the app. 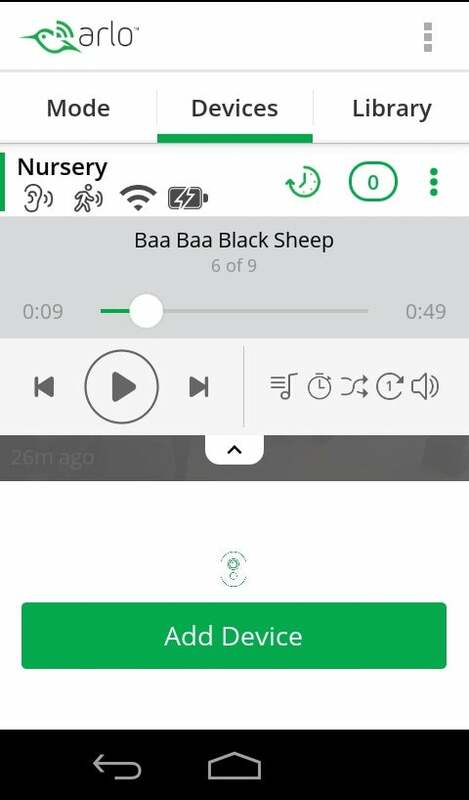 You can also record your own voice for playback if your baby finds that more soothing. Navigating the player is intuitive, with buttons for advancing and rewinding a track, putting a playlist on shuffle, and setting a timer to turn music on and off automatically. 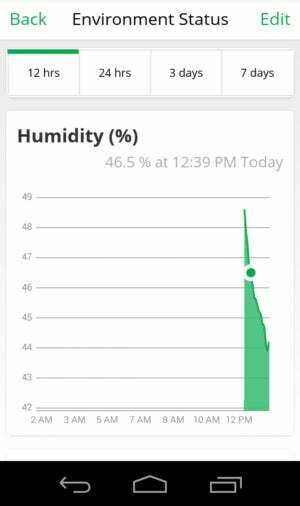 You can view up to a week's worth of indoor environmental readings in the Arlo app. The last icon, which looks like a line graph, takes you to the Baby’s environmental readings. It displays the current temperature, humidity, and air quality, and tapping on any of these will open a timeline displaying up to a week’s worth of readings. 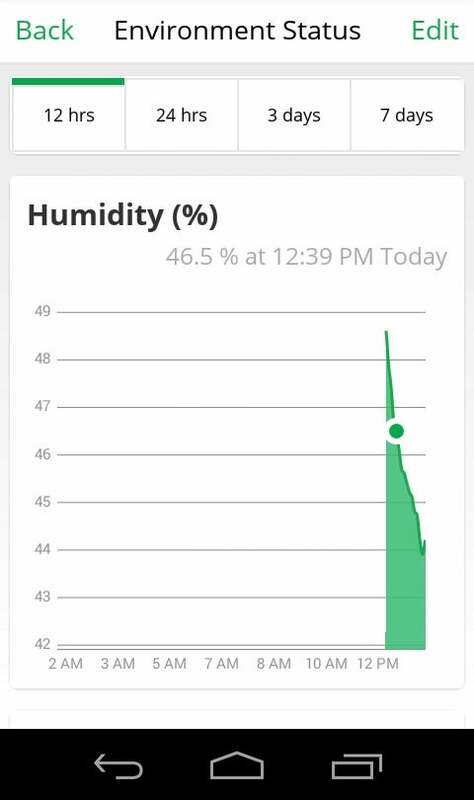 The temperature and humidity mirrored my thermostat and indoor hygrometer without fail. The air quality readings are less specific: You get only a rating of Normal, Abnormal, or Very Abnormal and are left to sleuth the cause yourself. You can set thresholds for each of these environmental readings and receive alerts when they fall out of range. The Arlo app also gives you a lot of latitude for customizing motion and audio settings. You can adjust the detection sensitivity for each; define motion detection zones for when you’re monitoring your child in a highly accessed area; and have the camera record video, take a snapshot, or do nothing when it detects an event. Most impressive, though, is the Baby’s use of machine learning to recognize when your baby is crying rather than, say, cooing or babbling. My kids aren’t babies anymore but when my 7-year-old stubbed his toe and started bawling the camera picked it up and identified it as such in a notification. Arlo Baby uses machine learning to recognize and alert you to your baby's cry. To say the Arlo Baby is an improvement over conventional baby monitors is a gross understatement. Netgear expertly married the rock-solid specs of its indoor cameras with well-thought-out features every parent of a child less than five years old could want, and made a typically ugly appliance cute to boot. That thrusts it to the top of our list of favorite baby cams.